Transportation Costs > How Much Does a Semi Truck Cost? How Much Does a Semi Truck Cost? Semi trucks are the large trucks we’re all accustomed to seeing on America’s highways, shipping and distributing all kinds of goods, playing a major part in the U.S. economy. Semi trucks offer an even weight distribution and are capable of pulling much larger loads than regular vehicles. 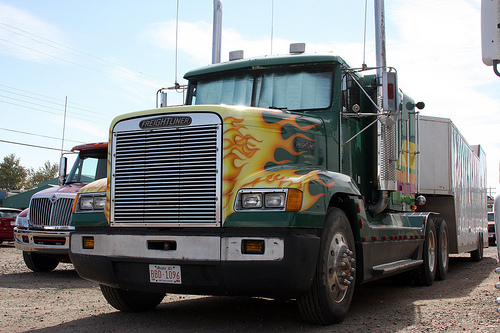 The price of semi trucks depends on the type, size, features, condition and dealer selling it. The price of semi trucks, just like a personal vehicle will depend on so many factors such as type, if it’s a day cab or sleeper, the brand, size, features, the condition and dealer selling it. With the factors mentioned above, the cost of a semi truck can range anywhere from $15,000 used to more than $150,000+, and this won’t include the trailer. If you’re buying new, however, plan on spending at least $80,000 to $150,000 for a barebone model. If you were to add on premium features, then the price could easily get close to $200,000. Used semi trucks, just like a personal vehicle, will always be cheaper. Used semi trucks can cost anywhere from $15,000 to $75,000. Obviously, the newer models can cost more than the ones that are older. Like a car, the cost of a semi truck will depend on the mileage, the year, make, model, where you live and who you purchase it from. For example, the company Trucker to Trucker offers different types of semi trucks that have different features such as air brakes and center floor supports. The company sells the semi trucks as well as trailers for anywhere from $15,000 to $35,000. The prices for the smaller semi trucks are considerably lower than the bigger ones that they sell. Freightliner.com says the cost of a new semi-truck will depend on numerous factors such as the size of the load you need to transport, if a cab is required and will it be driven in harsh weather? Smarter Finance USA says the cost of a commercial truck will depend on the age, condition, model and the number of miles on the truck. “Almost new” trucks will cost close to $100,000, while an older truck can be $30,000 or so. Trucks even older than 15 years can be even cheaper than this. What are you going to use this semi-truck for? Do you need a dump truck to haul dirt from a local location, or do you need an on-highway transporter that you need to haul across the country? If you need to stay out on the road for more than 24 hours, then you will need a raised or mid-roof sleeper to sleep on the road. Just like buying a car, all dealerships will have varying prices. While some models may only have a few thousand dollar difference, used models could greatly vary from one dealer to another. The same can be said about the geographical location as a semi-truck will probably cost more in a high taxed state such as California. What kind of engine do you want? What about the transmission, suspension, axles and/or components? The more you want to add and the more powerful you want your truck to be, the more you’re going to spend. We just touched on this, but let’s talk about it a bit more. Semi-truck engines will be based on the horsepower and fuel usage. Ranging from 200 to 600 horsepower, both natural gas and diesel models can be built for light to heavy-duty jobs. Citing Freightliner again, they also say the powertrain, turbo compounding, torque, emissions, Greenhouse gas regulations, the braking system and a decreased vibration can all affect the costs. Like the engine, the transmission can affect the costs as well. Like a car, you have a few options: manual, automatic and hybrid. Computer controlled transmission, for instance, will be pricier than a manual since it can control and monitor the fuel efficiency. Upgrading the suspension can make for a better ride, and some of your premium engines, such as a Detroit, Hendrickson and Merio, can offer single rear and tandem rear support to offer better support on the road. To effectively ship goods, a semi truck needs to have a semi-trailer attached to it. The price of the semi-trailer can be different depending on the type as each trailer has specific uses that require additional features to be included with it. If purchasing new, adding additional options, just like a new car purchase, can add to the overall cost. For example, leather seats and built-in appliances in the cab can increase the price. Don’t forget recurring costs, just like a car such as fuel costs, oil changes, insurance and any routine maintenance. Drive Big Trucks infographic says the average commercial truck spends $180,000 operating a semi and repairs/maintenance can be $15,000 annually. As for insurance, there are nine different types of insurance on the market, averaging close to $6,500 per year. If purchasing used, bring a mechanic who is familiar with semi trucks with you to check the vehicle thoroughly before you buy it. Of course, you don’t have to pay in cash up front and loans are available to those who qualify, usually at either the dealer or through various banks. When shopping for a semi truck, don’t just shop for the truck, but make sure you shop for the financing rate as well.